'Tis the season to be skeptical. Despite its pessimism, that statement propels the hilarious, cynical, and thought provoking production of SantaLand Diaries at The Ocean State Theatre Company that opened this week. Amidst saccharine Christmas entertainment, SantaLand Diaries pushes us to see that "holiday cheer" can be unsightly throughout this bold yet comical examination of a holiday usually safe from scrutiny. SantaLand Diaries is a one-person performance piece based on humorist David Sedaris' well-known memoir, adapted to the stage by Joe Mantello and directed by Amiee Turner. It hurls the audience into the sidesplitting journey based of Sedaris' own experience when his underwhelming job search leads him to the cheerful Macy's Department Store in Manhattan working as a Christmas elf named Crumpet. Crumpet soon learns that everything is not what it seems at the unsettlingly jolly nature of Macy’s. Crumpet the Elf is played marvelously by Lennie Watts. Crumpet is difficult for any actor because he must portray a feeling as heavy as Crumpet's cynicism towards Christmas cheer in an engaging and comical way. Watts accomplishes this by turning a one-actor-performance into a production with many characters through changing his demeanor for each character he introduces. These elves include angst-ridden struggling artists, fired workers of advertising firms trapped in this pit of merriment, and the fat flirtatious elf "The Walrus" who hits on mothers while their children are sitting on Santa's lap. Crumpet sees that all of these individual characteristics are suppressed by the relentless and practically inhuman cheerfulness every elf must have. How can human beings be that happy all of the time without lying? Ironically, the only worker who fully embraces their role is "Santa Santa", whom Crumpet deems as psychologically unstable. While all of these elves may be grinning broadly, they all really are haunted by unfulfilled dreams and the desire to be somewhere else. Perhaps we should all question the individual behind the elf. SantaLand Diaries' success as a play stems from it pointing out experiences we have witnessed during Christmas time but choose to forget. Audiences roar with laughter when Watts speaks of parents threatening their children to smile for Santa, the Santa Clause spitting all over your child and playing it off as frost, and that obnoxious family from Jersey who thinks Santa’s picture area is a house party. This resonates with the audience because we have all been there. Despite a few sensitive subjects prodded by the play, such as the ever-looming question of where the multi racial Santa is, SantaLand Diaries covers all of these humorous Christmas experiences tastefully. Is SantaLand Diaries asking you to give up on Christmas? Certainly not. Is it a conventional feel-good Christmas play? I would have to disagree. However, this play is full of laughs and encourages us to take a look at the holidays for what they are; enjoyable, chaotic, and a lot of fun. 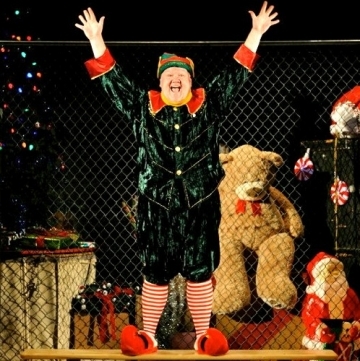 Santaland Diaries, through Dec. 30 at Ocean State Theatre Company, 1245 Jefferson Blvd, Warwick. For tickets, call (401) 921-6800 or go online to www.oceanstatetheatre.org.